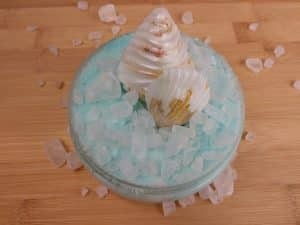 A Whipped Foaming Sugar Scrub is a sensory treat for your bath or shower. The combination of a luxurious whipped bath butter, and exfoliating sugar scrub is what makes it special. This recipe can be tailored to fit any niche, so you can make a version that includes your favorite fragrances, additives or colors! The basic recipe is simple and fit for any crafting level. This recipe just requires three key ingredients. Other additives such as color, oils, or other exfoliates are decided by you the creator. However, I will give you a variety of options that I love to use. First, add all of the ingredients to a large bowl. The foaming bath whip will almost double in size. Then, whip all of the ingredients together using a hand or standing mixer, they both work equally well. Finally, spatula the finished whip into your containers. You should avoid over mixing this product, for it could cause it to collapse. While still usable, it simply does not look as decadent. And If you use the Turbinado sugar the scrub will be a brown color. Here are some complementary ideas, and recipes for different renditions of the Foaming Sugar Scrub. Use them for inspiration and add your own twist. Foaming Unicorn Scrub, topped with a soap horn and glitter. Split the batch into three parts, making one larger than the other two parts. Then mix in 3 drops at a time of pink colorant and a teaspoon of glitter into one of the smaller batch parts. Repeat with the other small part and blue colorant. Then add all parts into your containers and lightly swirl until you achieve the look you want. Finish it off with a sprinkle of glitter. Sea Foam Scrub topped with soap shells and coarse salt. Foaming Sugar Scrub recipe from above. Separate the batch into two parts. Add a few drops of the blue colorant to one of the parts and mix well. Alternate the uncolored scrub and the blue scrub when filling it into your containers. Then add the course bath salts to the top of the scrub. *optional* Make Melt & Pour soap seashells to add on the top. For a pearlescent finish buff magic mauve onto the face of the soap. This will give a shiny shell effect to the soap. 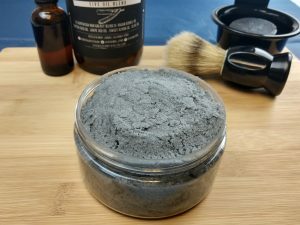 Foaming Sugar Scrub recipe listed above. First, dissolve the charcoal into the oil of your choice until it’s as dark as ink. Then add the charcoal mixture with your fragrance oil. Add as much or as little until you get the shade of grey you need. For each variation, we used this hand blender. It comes with several attachments. However, for this recipe you will need the whisk attachment. This blender has lasted us a good while for recipes made for the blog. The interchangeable attachments come in handy for all sorts of recipes.